What They Say.....When it comes to love, never say never. What I Say....When I started this book, I was a little worried because I didn't really care about Nancy or her cheating husband, but once she got to London, the story got good! Carmen is sad widow who is working at a homeless shelter, pretending to be poor. When her friend Nancy comes to stay with her after catching her husband cheating, it starts a chain reaction which quickly fills Nancy's townhouse. Soon her brother-in-law Rennie has also moved in indefinitely along with Nancy's mom, who takes care of all of them. Add in a hot neighbor with a meddling teenaged daughter and suddenly there are romantic triangles everywhere! The book got really good because there were misunderstandings were everywhere! People were constantly getting huffy or overhearing the wrong things. I really, really liked this book. I stayed up until after midnight finishing it, just hoping the right people would find their way to each other. 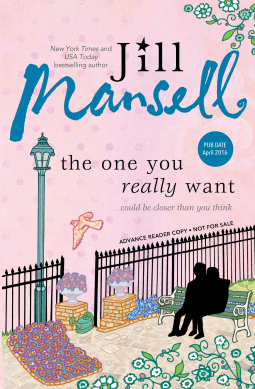 I've never read Jill Mansell before, but I'll be looking for her now!